The other day, when I was trying out a new-to-me hand embroidery thread – Aurifil’s stranded embroidery floss – I had one of those strange Groundhog Day moments. Déjà vu, repeatedly. 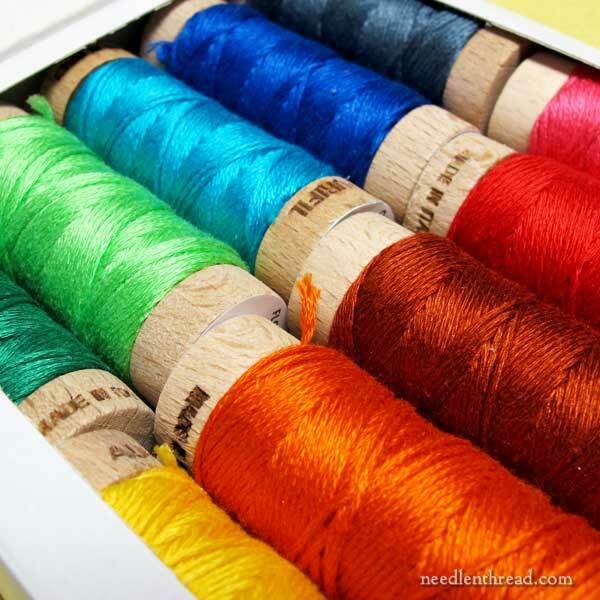 Today I’ll tell you a little bit about this stranded cotton embroidery floss from Aurifil, which is called Aurifloss. Have you ever anticipated something you were determined to like? That’s how I felt about Aurifloss. A reader mentioned it to me, and my curiosity was piqued. I’ve seen Aurifil’s machine embroidery threads, but I didn’t know they produced a stranded embroidery cotton for hand stitching. And, upon delving into the subject, I discovered that it comes on …. I love it when hand embroidery threads come on spools. And I’ve never seen a six-stranded thread available commercially on spools. What a divinely inspired idea! No pull skein! As I anticipated the arrival of the threads, I was already determined to like them. And when they arrived, I was immediately besotted. Neatly arranged spools loaded with colorful hand embroidery threads, all lined up in little white boxes – what’s not to love? But, but…. I didn’t want to lose my head before I tried the threads! We might say “presentation is everything,” but when it comes to threads, I tend to judge more by performance. Aurifloss comes in 270 colors. There are 18 yards on a spool. The spools are somewhat rustic little wooden spools, not plastic spools. The threads are made in Italy, out of long staple cotton. Testing 1, 2, 3, 4, 5…? Well, like I said, performance is everything, so I set about testing the threads as far as stitchability goes. And this is when I had my Groundhog Day moment. I was working with this bright blue thread out of what I call the Southwest Box – the box of bright colors in the first photo above. I cut the thread and separated out a few strands to stitch with (this is called stripping the floss, and you can read about it here). I wasn’t paying a lot of attention to the number of threads I was fiddling with, but more to the feel of them. When I stripped the threads, they ran through my fingers and felt decidedly less smooth than other flosses. They felt “dry” and a little bumpy. They felt, in fact, like linen thread more than cotton thread. My thought: Oh golly, this stuff is going to pill. I embroidered for a while with the thread, and I noticed some points while I was stitching with it. 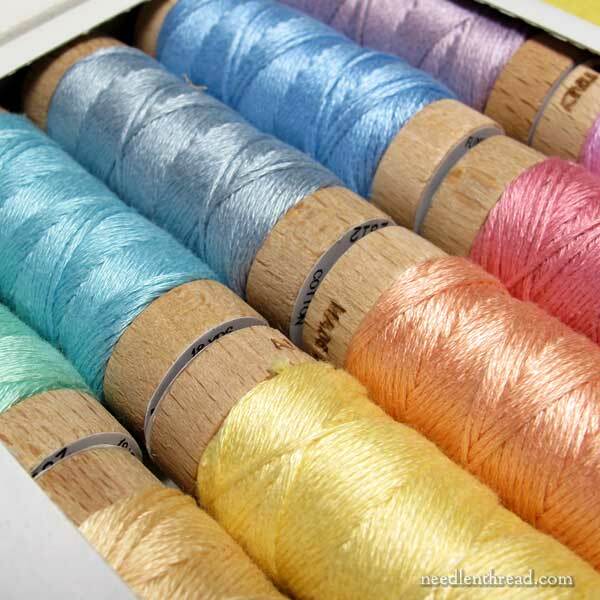 First, I noticed that it is finer than most 6-stranded embroidery floss. I would say three strands of Aurifloss are equal to about two strands of DMC or Anchor. I found this a bit odd, I guess, because in the floss world, there’s a lot of cross-flossing. For example, I can substitute Anchor for DMC or DMC for Anchor, or I can mix and match DMC and Anchor together very happily. If I want to throw in some over-dyed threads from somewhere, I can. And I can use two strands of all of it and be pretty sure my stitching will be consistent. But this thread doesn’t really fit into that picture. This isn’t necessarily a bad thing. But it did strike me as curious that it’s so noticeably finer than other standard 6-stranded cottons. The thread did not pill after all, and I was surprised about that, but pleased. I do not like threads that pill! Time to switch threads! So I reached for the remaining three strands to strip them. I stripped them, but there were only two strands. Hm. I must have separated an extra strand and left it lying about…. Stuck to some other part of me? …writhing around, searching… standing up…patting down my clothes…searching. Ok, getting on with it, I cut another piece of thread, separated out three strands, and kept on stitching. I came to the end of the thread. I reached for the remaining strands. Maybe I separated four out when I cut the thread… No, you didn’t. You would’ve noticed. Well…ok, obviously I separated four strands out and put one down. …and finally, cutting another length of thread. The third time it happened, I realized it wasn’t me. Examining the thread closely, this is what I found. It’s like a 7-shot six-shooter! Only it’s a 5-stranded six-strander! An anomaly! An amazing phenomenon, even! I felt like I had discovered a new species! Then I started second-guessing. Maybe it’s not really six-stranded thread. Maybe it’s five-stranded. I would probably list this particular point about the thread – obviously a quality control issue – under cons, even though I have to admit, it was a fun discovery! Overall, I’m not really keen on the feel of the floss. It has that “dry” feel that I associate with cheaper craft threads. If you’ve ever stitched with Sullivan’s, it’s kind of like that. It just doesn’t feel like a good thread. Surprisingly, though, it didn’t pill. Other craft threads usually do. I can see where a finer cotton floss might come in handy some time, so maybe the difference in weight is a good thing. But I can also see how it could be problematic if you tend to mix brands while you’re stitching. The floss worked up pretty well. This is the one area that I was really surprised about! When I was working the chain stitch and the stem stitch, I never had any kind of twisting or knotting or anything. I didn’t have to drop my needle to let the thread untwist. It just never twisted on itself. Now, that is an anomaly! Normally, when you’re working with floss – especially on stitches like stem stitch or a stabbed chain stitch – you’ll get some thread twist going on, and you’ll have to pause and let your thread untwist. It literally never happened with this thread. I don’t know why. The thread is more compact that DMC or Anchor. It’s doesn’t seem to have a soft “spread” to it, that you’ll get with other stranded cottons. I haven’t tried it yet with long and short stitch, but I suspect that it won’t blend as well as softer threads do. And finally, though there is a slight sheen from mercerization, it isn’t as much as the sheen you see on other mercerized cottons. 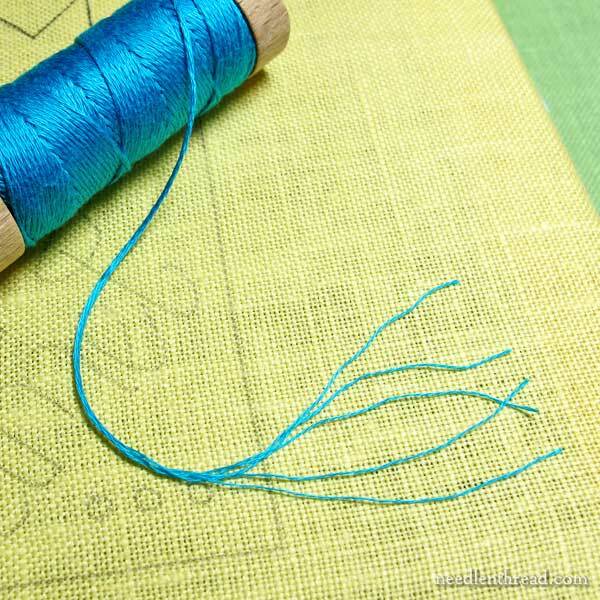 In fact, when stitched up, this thread almost looks matte. It’s an interesting thread to try. If you’re looking for a finer stranded cotton, it might fill the bill. But I think there are some quality control issues, and I’d not be willing to replace tried-and-true threads like DMC and Anchor with this particular floss, or trust it on a project that I’m putting lots of hours and effort into. You can read the indications about Aurifloss here, if you want to know about washability. Have you tried Aurifloss? Any input on the thread? I’d love to hear your take on it! Or do you have any questions about the thread? Feel free to chime in below! October 19, 2012 Cotton Floss in Color Palettes – New from Sublime Stitching! January 26, 2010 Cotton Floche: What’s Not to Love? This is interesting to know, thank you Mary! I have been slowly experimenting with the different weights of Aurifil’s machine and hand sewing threads for quilt piecing and applique. Using the 50 wt thread for hand applique last week, I noticed the same as you — it does feel dry. I thought it was just old! Their main claim to fame for machine sewing is that the thread is very strong, and doesn’t produce much lint. For applique though, I am still on the fence. I also have a few spools of their 12 wt thread that I intend to try for hand quilting. Those threads have a beautiful glow to them, not as shiny as perle cotton, which to me is a good thing. The colours are wonderfully saturated, and I have high hopes for them! Great post, Mary. I’ve heard of this thread, but never seen it anywhere. Normally I’m not a pastel person, but those spools of the pastels made me yearn for them. Hi, Carol – Well, just a caution: try before investing in a lot of them! It’s definitely a different thread! I adore, beyond measure, Aurifil thread for hand piecing. I do not, even one little bit, like Aurifloss. I tried to like it, but 1)I cannot use it with other brands unless I want different textures in a piece, 2)the loose, working thread seems to want to stick to the fabric, as if I were stitching on sandpaper and friction were grabbing hold of the thread, and 3)it did not wear well on the three functional pieces I’ve used it on. However, I do like it for blackwork! The colors are lovely, though, and I’m sure I’ll find a use for the floss I still have…but I won’t buy it again. Because space bar is sensitive. 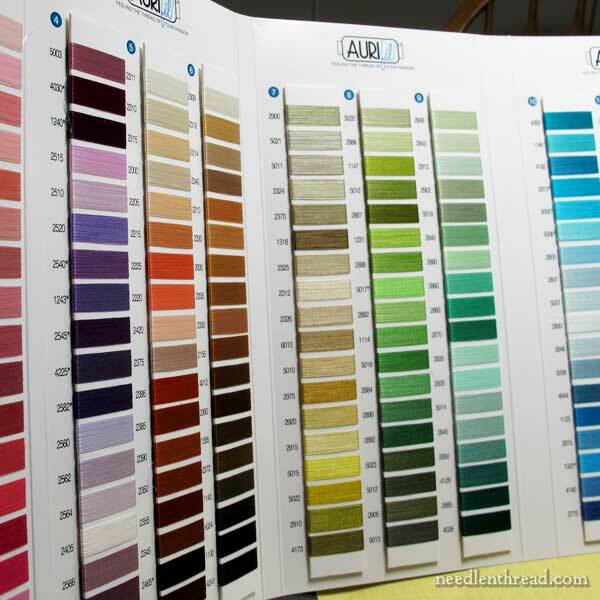 I use aurafil for sewing but not sure I would change because I really prefer DMC and Anchor threads for xstitch and embroidery. Aurafil is awesome for machine sewing. Thank you, I do a lot of blackwork and often look for different weights. Thank you for this review. I saw an advertisement in one of the cross stitch magazines and thought the thread was too fuzzy and dry looking. One alternative to traditional 6-stranded floss that I have fallen in love are the Sulky 12-wt petite cotton threads. They are on spools, which I don’t like, but I do like them for cross stitch. 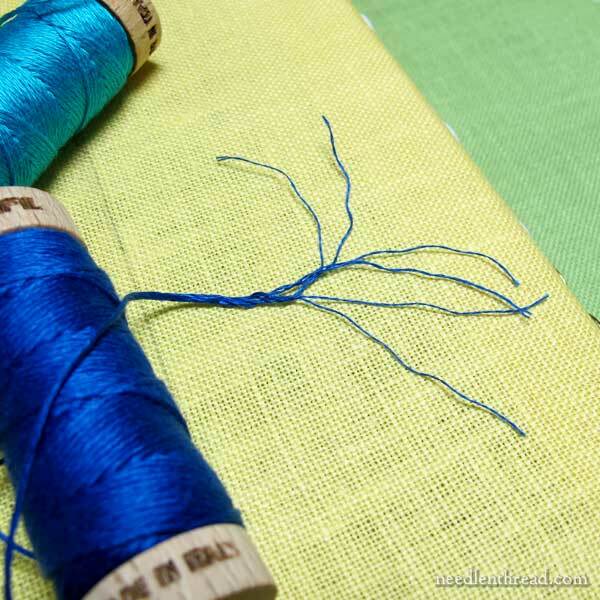 One thread covers like two strands of traditional thread. I have even used them in patterns where I have used two strands of regular floss and it looks fine…I only make simple cross stitch designs and ornaments. Yes, I think I’m with you, Jessica. I can’t see it making a place in the embroidery market. There are some interesting things about it………but…….. overall, I’m not super thrilled with it. I prefer the range, the feel and quality of DMC and Anchor! Thanks for sharing this information. I normally stay with the tried-and-true stuff – mostly for budget reasons, but it’s good to know about this. Mary, I had never heard of Aurifloss so I went looking at all my favorite places to shop or order thread and finally simply put Aurifloss in the search engine and found it at Pumpkinvine Corner which is located in Georgia, USA, and is a mail-order business for quilters. Aurifloss is used for tying quilts. Fascinating that this came up in your column. I have been trying to accurately stitch Sunbonnet Sue hands with separated fingers and between the thickness of one strand of floss and my arthritic fingers the battle is joined. This may be a solution, might try it. Thanks for bringing this to our attention. Very interesting. From your description, it sounds like this floss is more suitable for needlepoint filling stitches or darning designs, rather than cross stitch – yet you say there is no spread to help with burying the thread into the ground. That’s too bad.! The non-twisting part is a surprise. Are you sure there isn’t any rayon blended in? Or is the thread size narrow enough to spin around in the eye of the needle? Because of the matt effect, could it be used for Mountmellick? It sounds like there might be some kind of coating, since there are the knots where joined, but doesn’t pill. Does it lint when stitched or flake when scraped? Dry feel comes from rubber, and some dyes. Very complex! Thanks for the review. No, it isn’t matte enough for Mountmellick. No, I don’t think there’s any coating. I’m not sure what you mean by knots where joined? It doesn’t pill, lint, flake, or anything like that. It would probably be ok on needlepoint, if the canvas is fine enough, but there’s not a lot of spread in it, which is always nice on a canvas. 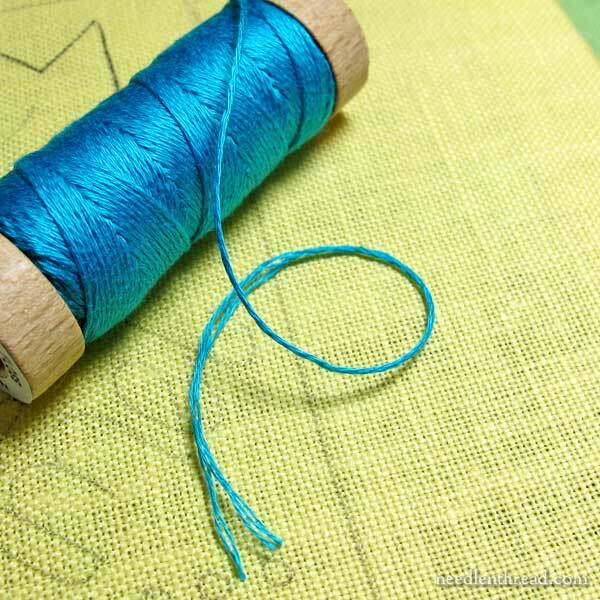 Now, keep in mind the thread IS a twisted thread – it just doesn’t boing up and twist when used. There’s no rayon – it’s 100% cotton. So it is a thread that baffles me. You might try Sulky hand stitching thread…Sulky 12 wt cotton. I like it a lot and it doesn’t twist as bad as DMC. My only problem is finding it as it isn’t well known here in Mankato, MN. Just food for thought…I’d like to hear your take on it too. Thanks Mary! You’re great! Thank you for such an informative article, and thanks to all of the commenters who also are very informative. I have never even heard of Aurifloss, but I love Aurifil thread for general sewing and piecing of quilts. 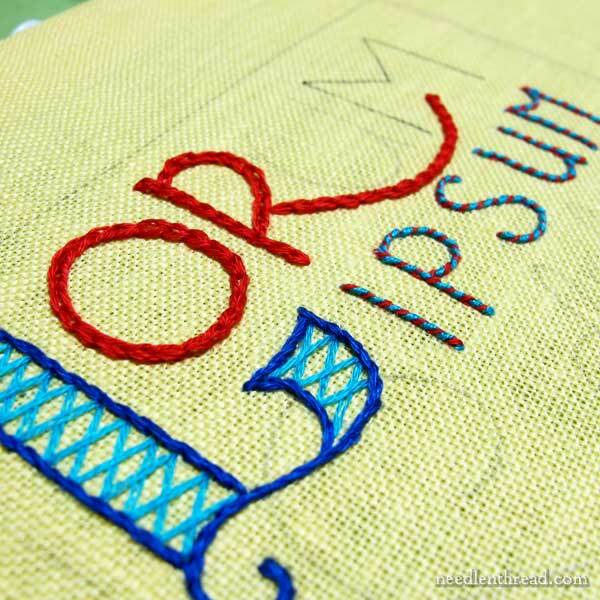 Since you say it doesn’t spread much, it probably won’t be very good for satin stitch, don’t you think? I have so much DMC (pretty much the whole color range) and also quite a lot of Anchor, so it doesn’t make much sense to even try something new and not quite as good as the old standbys. I will try out the Sulky 12 pt, however. Brutally honest reply: It’s terrible for satin stitch. Thank you for the interesting article and the introduction to a new thread for me. I have not heard of Aurifil thread, and would like to try it. As you do, I really like wooden spools, and most of the places I have looked show plastic spools. Will you tell me where you got your boxes of wooden spool thread, please? The colors are gorgeous, by the way. Your photography does a great job of showing the strands very clearly, too. Thank you for all your information. LOL! You can buy DMC on cones, in large amounts, I believe. But they are Large Amounts! I tried it. It is okay. It is really much costlier than DMC so unless it was a specific color I would not use it. The company also does this thing where they have designer make small patterns. They company is not very kind to the sewer, because the pattern may use any of their colors in sometimes the most unbelievably tiny amount. They did a block of the month thing a few year ago. The squares were 4 by 6 and it required 4 to 6 threads per block. Mary! Thanks so much for your review. I have tried the Aurafil floss as well. I really did not care for it. It felt thin and emaciated to me. I just didn’t like the texture of the thread. I had to shorten my thread length and was surprised that it did not tangle. I did use it in my project but had to add a little DMC to make the thread look fuller. I don’t wish to make an investment in more of the Aurafil floss. I am certain I can use it in another project, I had chosen black. It does seem a bit flat in color. I’m glad I bought only 2 spools. The spools are cute but I will stick with DMC. Thanks again Bobbie B.
I use Aurifil for a lot of my sewing and it seems like good quality thread (and my sewing machine likes it better than some other brands I’ve used), but I guess I don’t feel like there’s a big hole to fill in the floss market, so I’ve never been terribly inspired to try out their flosses. I was sent a spool of it though (in a mini pack with one of each size of the cotton threads), but I’ve never used it. I thought it looked kind of fuzzy in a way I didn’t like the look of. One of these days I’ll dig it out and give it a try though. Hi, Kristel – yes, you’re right – it’s not as smooth as other floss, and it does tend to look a bit fuzzy on the spool. When my smocking friends and I first heard of this floss we were interested. I haven’t actually stitched with it because the website said you couldn’t put it in a warm air dryer. That sounded weird to me so I emailed to Aurofil and got a response that says the same your information does. It seems like items that have this floss in them cannot be put in the dryer. That definitely takes it out the the realm for smockers as far as I am concerned. I haven’t used or seen Aurifloss. Perhaps, being spooled, it might work for punch needling. Aurofil thread remains my favorite: very strong, very fine. Had not seen the floss before. If it’s strong, doesn’t twist or pill and is matte, it sounds good for quilting. I personally would like to try it for marking linen or similar projects where utility is as or more important than decorative effect. Strong matte floss is a good thing then. Hi, Natalie – Just to clarify, it’s not perfectly matte. It’s just doesn’t have as much sheen as other mercerized cottons. I think I have found the answer to your question about threads twisting! I just took a fabulous art quilting/thread painting class with wonderful Pam Holland. She said to use threads in the sewing machine that don’t twist and tangle. She said Aurofil and Masterpiece by Superior and cotton Sulky, all have a Z twist. You would know about this if you are a spinner of yarn. You can spin in one direction and the thread looks like the down stroke of a Z and if you spin the other direction it looks like the downstroke part of an S. In yarns and thread, it is either S or Z. Kit is much easier to crochet with Z spun yarn. Most thread manufacturers spin S. And, as I looked at it today, so is DMC stranded thread. Hi, Robin – thanks for your comment. Cotton threads for hand embroidery are all s-twisted. I looked closely at the Aurifloss, and it is s-twisted as well. You can find an article on that here: https://www.needlenthread.com/2011/01/s-twisted-vs-z-twisted-embroidery-threads.html and in the article, at the end, I link to another article on the subject, where I show stitched samples with the two different twists. Rayons and some silks (and of course, machine threads) are z-twisted, which affects the way the stitch looks. For example, a stem stitch worked in the standard way will look like an outline stitch, when embroidered with a z-twisted thread, while it will look like a regular stem stitch, when worked with an s-twisted thread. Well, I won’t go into all the details – it’s a little clearer on the articles through that link! As I read this post, I found myself saying a rude word over and over again as each negative emerged. Like you, I love threads and I love collecting them. 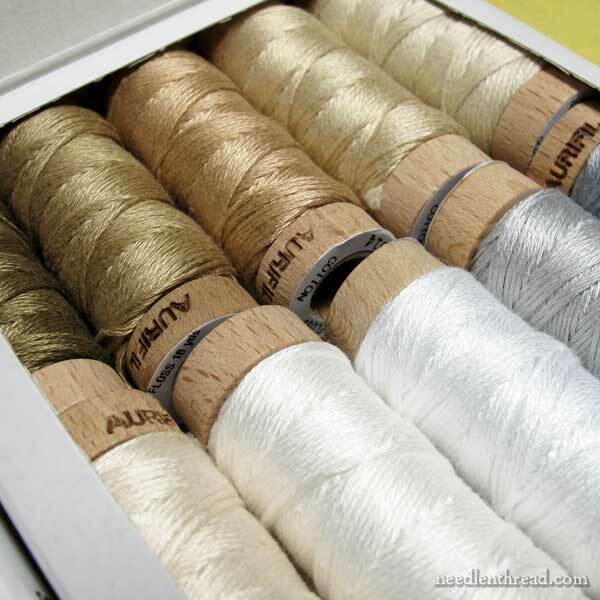 And I love the idea of these being on spools, but like you I want good quality thread not just pretty presentation. I’d never even heard of, let along tried, this thread, but I do have a 5 strand skein of Weeks Dye Works thread!!! Mary, I have a question for you. There is a cross stitch pattern I want to stitch one day (Big Red Ship of Life, by Ink Circles), that I dream of doing one over one on 40 count. I was thinking I would need to give in and go no finer than 35/36 count, simply because I’ve always found over one tricky on the higher counts as I run out of /room/ for the floss because it ‘fills up’ all the space. Do you think this floss is enough thinner than DMC/Anchor that it might be worth investigating for this? Hi, Olna – Yes, I think it is fine enough that it might make a difference, but I would worry about the quality overall. I’d carefully test each color for colorfastness, etc. I don’t know that it would be worth using it, at the price (the thread is definitely more expensive than DMC), especially if using it would lead to a frustrating experience, or any problems with color running, etc. In short, I’d proceed with caution. I don’t think there’s a conversion chart for the colors, either, and considering DMC / Anchor have over 400 colors, you might end up short on some of the colors. I was wondering if this product would be useful as a tatting thread? I am looking for products with a wider range of brilliant colors. And for tatting the amount of strands is not as important as long as it remains fairly consistent throughout the spool. Thank you for your time, and beautiful work. No, Tauri – I don’t think so. The thread is not really consistent. I was looking forward to using Aurifloss embroidery threads as well. I found working with 6 strands of thread for a folk appearance and a straight stitch difficult. A few times one errant thread would pull and fray where the other strands were getting displaced. I finally pulled the frayed thread down to the base of my work and cut it clean and worked with the other 5 strands and managed to stitch a line of stitching that looked well. The threads are definitely rough and not smooth as DMC embroidery floss. I agree the strands are light and flimsy and feel like a cheaper version of embroidery floss. I will not be buying them again. I feel the best thing about them is that they come on spools. The colors are lovely but happy I only bought a few of them. Previous Previous post: Color Complements Thread – Winners! !